USES: This medication is used to control dandruff. Use of this medication may help to relieve the flaking, scaling and itching associated with dandruff. Ketoconazole is an azole antifungal that works by preventing the growth of fungus. 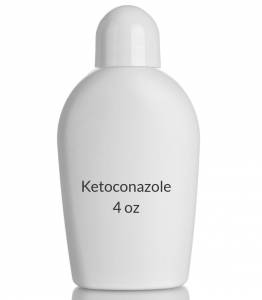 Ketoconazole 2% shampoo is also used to treat a skin condition known as pityriasis (tinea versicolor), a fungal infection that causes a lightening or darkening of the skin of the neck, chest, arms, or legs. HOW TO USE: Wet hair and scalp completely with water. Apply enough shampoo to produce enough lather to clean hair and scalp. Massage gently over entire scalp. Rinse hair with warm water. Repeat this process if directed to do so by your doctor. Dry hair thoroughly after the final rinse. If using the over-the-counter strength of the shampoo (1%), apply the shampoo, lather, and rinse thoroughly. Repeat this process. Dry hair thoroughly after the second rinse. If treating skin other than the scalp, wet the skin and apply the shampoo to affected area and the surrounding healthy skin. Lather and leave in place for 5 minutes, then rinse off with water. Dosage, number of applications, and the length of treatment depends on the strength of the shampoo (2% or 1%) and the condition being treated. Carefully follow your doctor's instructions or the package directions. Avoid contact with the eyes. If the shampoo gets into the eyes, rinse thoroughly with water. Do not begin using the shampoo if your scalp/skin is broken or swollen. Inform your doctor if your condition persists after 2-4 weeks of treatment or worsens at any time. SIDE EFFECTS: This medication may cause abnormal hair texture, discoloration, irritation, or pimple-like bumps on the scalp. There may also be oiliness or dryness of the hair and scalp. If any of these effects persist or worsen, notify your doctor or pharmacist promptly. If your doctor has directed you to use this medication, remember that he or she has judged that the benefit to you is greater than the risk of side effects. Many people using this medication do not have serious side effects. Tell your doctor immediately if any of these unlikely but serious side effects occur: hair loss. A very serious allergic reaction to this drug is unlikely, but seek immediate medical attention if it occurs. Symptoms of a serious allergic reaction may include: rash, itching/swelling (especially of the face/tongue/throat), severe dizziness, trouble breathing. This is not a complete list of possible side effects. If you notice other effects not listed above, contact your doctor or pharmacist. In the US - Call your doctor for medical advice about side effects. You may report side effects to FDA at 1-800-FDA-1088. In Canada - Call your doctor for medical advice about side effects. You may report side effects to Health Canada at 1-866-234-2345. PRECAUTIONS: Before using ketoconazole, tell your doctor or pharmacist if you are allergic to it; or to other azole antifungals such as clotrimazole, econazole, or miconazole; or if you have any other allergies. This product may contain inactive ingredients, which can cause allergic reactions or other problems. Talk to your pharmacist for more details. Before using this medication, tell your doctor or pharmacist your medical history. This medication should be used only if clearly needed during pregnancy. Discuss the risks and benefits with your doctor. It is not known whether this drug passes into breast milk. Consult your doctor before breast-feeding. NOTES: This shampoo may remove the curl from a permanent wave in the hair. When treating pityriasis, this medication may not cause an immediate return to normal skin color. It may take several months after treatment is completed for your natural skin color to return. STORAGE: Different brands/strengths of this medication may have different storage requirements. Read the package labeling or ask your pharmacist for the storage requirements for the product you are using. Protect from light. Do not store in the bathroom. Keep all medicines away from children and pets. Do not flush medications down the toilet or pour them into a drain unless instructed to do so. Properly discard this product when it is expired or no longer needed. Consult your pharmacist or local waste disposal company for more details about how to safely discard your product.